Information and communications technology (ICT) is playing an important role for people’s lives and social and economic development in Cambodia (ICT4D). The UN’s 2030 Agenda for Sustainable Development Goals considered ICT infrastructure as an important cross-cutting sector ‘means of implementation’ that supporting the achievement of every goals and targets of SDGs. Thus, it has stated that “the spread of information and communications technology and global interconnectedness has great potential to accelerate human progress, to bridge the digital divide and to develop knowledge societies”. Working together between government, private sector and civil society organizations within the national or international framework provide significant opportunities for enhancing cooperation between each other​ to give any inputs and feedbacks, sharing knowledge and experiences in order to implement and monitor the Cambodia SDGs based on the set goal, objectives, and indicators in various development sectors through ICTs. The success factors should not be happened without awareness raising on CSDGs process and mechanism, ICT4D, and as well as building capacity of all key local actors so that the localization SDGs is taken ownership, initiatives and contribute the UN’s SDGs in 2030. Given the support from the Swedish International Development Cooperation Agency (SIDA) through the Swedish Program for ICT in Developing Regions (SPIDER), the SPIDER ICT4D Cambodia Network project implemented by the Open Development Cambodia (ODC) in closed collaboration with the General Department of ICT of the Ministry of Posts and Telecommunications (MPTC)​ through the Department of Computer Software and Contents, and the Faculty of Development Study (FDS) of the Royal University of Phnom Penh (RUPP) are considering to restart the National ICT Workshop with the proposed title aforementioned below. The National ICT Workshop is conducted to promote discussion and awareness raising on Cambodia SDGs and the role of ICT4D, and how ICT contribute implementing and monitoring Cambodia SDGs. Thus, the workshop discussion will be a getting started to build a space of engagement and discussion platform as well as future collaboration between government and non-government key actors. 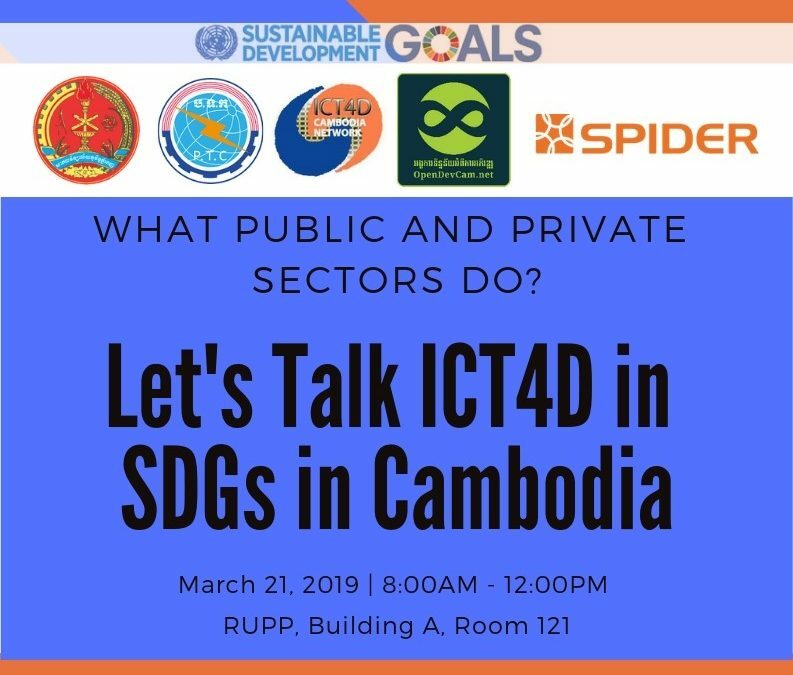 This workshop will bring about 50ps of key relevant gov’t’s ministries, private companies, CSOs/NGOs, media, and students, in particularly the ICT4D’s practitioners in Cambodia who are the key playing role to promote the use of ICTs for improving their development sectors.